Adam C. Doupé is an experienced civil litigator who helps clients to resolve complex disputes. Mr. Doupé’s experience includes formulating trial and appellate strategy, drafting legal briefs, preparing dispositive motions, and developing pre-trial and post-judgment discovery. Mr. Doupé has appeared before courts throughout the state, including the California Court of Appeal. In addition to his litigation experience, Mr. Doupé has also advised high net worth individuals in asset acquisitions, financings, restructurings, and dispositions. To that end, for high net worth and investor clients, Mr. Doupé has prepared partnership agreements, operating agreements, promissory notes, security agreements, and boat mortgages. 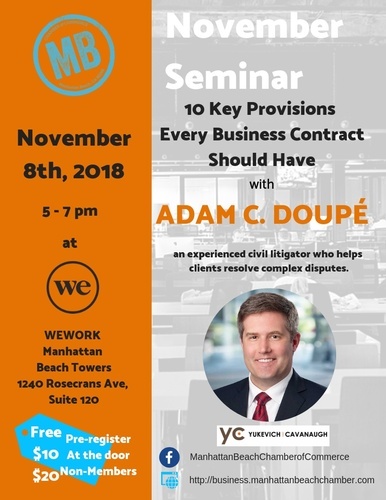 Join us, September 18th at Wework Manhattan Beach to hear Mr. Doupe share his knowledge. Bring your business cards!